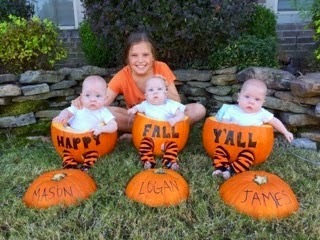 It’s not fall until you put babies in pumpkins right?! Ok maybe I made that up. But it should be a real thing. 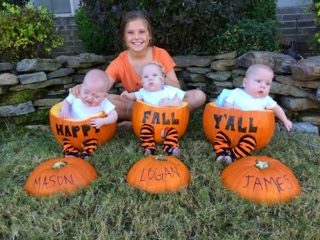 So several of my triplet mommy friends on Facebook have posted pics of their trio in pumpkins over the last few weeks and they’re adorable! (Sorry can’t share other peoples pics. But just know that their babies are super cute too!) Anyways, I didn’t think we could do it because the boys can’t really sit. Actually they can’t sit at all. James can sit in a bumbo seat. Mason and Logan can only keep their heads up for about 30 seconds before they get tired and lose control of their heads (maybe a little longer I haven’t timed them). But I found out that, guess what?! 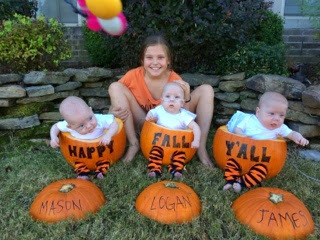 They don’t have to be able to hold their heads up to sit in pumpkins. Yay! So needless to say I was pretty excited! This was my one goal for the weekend. (I also cleaned bathrooms, did laundry, went running, and other productive things). So Addison and I went to Kroger for pumpkins yesterday. Of course they were almost out. But not quite! They had just a few left at the bottom of the pumpkin box. I almost fell in trying to get them out! Sorry no pictures! But here’s some help for your mental picture – they keep the pumpkins in this big cardboard box that sits on pallets. Sounds nice, but the box is about 4 feet tall. So I had to lean my entire body over the side to reach the pumpkins at the bottom. And they weren’t small pumpkins either. 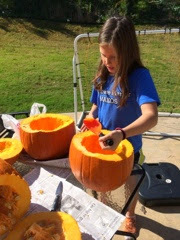 And Addison helped scoop out the pumpkin guts! Then of course I wrote on the pumpkins. With the fanciest crafting tool ever. A sharpie. And finally . . . Picture time!!! This went waaaayyyy better than I expected! 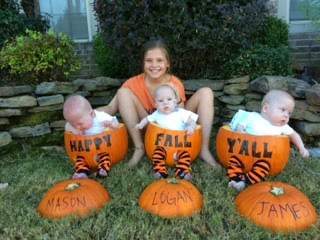 Only 1 baby cried (Mason) and no one fell out of his pumpkin. 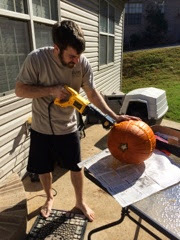 Also no one got stuck IN the pumpkin (although Logan’s pumpkin was a little snug). I call that a success! I posted the best one at the top. Here’s a few outtakes. I’m pretty happy with the picture! I hope you like it too! Oh and I’ll leave you with one sad pup in his Halloween costume. 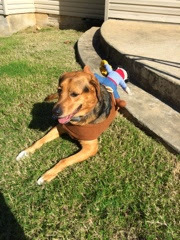 He’s been wearing it all day. And he’s not happy with me at all! 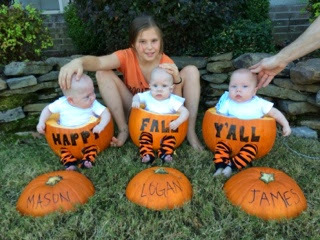 This entry was posted in #goals, Addison, Family, Halloween, Holidays, Triplet Milestones, Triplet Mom Hacks by Angela Mann. Bookmark the permalink.